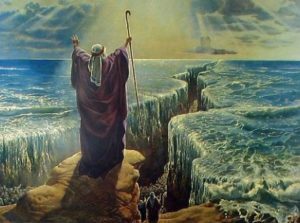 In this week’s parasha, Noach, we read about how the seventy primary descendants of Noah settled the Earth after the Great Flood. Noah had three sons, and it is often said that they divided the three continents of the Old World amongst them: Yefet (Japheth) got Europe, Shem got Asia, and Ham got Africa. This is not exactly accurate. In fact, essentially all of the seventy places inhabited by Noah’s descendants are places in modern Turkey or the Middle East. This makes sense, since the Torah was originally speaking to an audience that was unaware of most of Europe, the Far East, sub-Saharan Africa, and needless to say, the New World. The Torah mentions the origins of those territories that were familiar to the ancient Israelites, and that would have been their immediate neighbours. It also makes sense practically, since Noah got off the Ark in Ararat—somewhere in modern Turkey—and his children and grand-children would have settled lands that weren’t too far away from there. Mt. Ararat, as seen from Yerevan, Armenia. 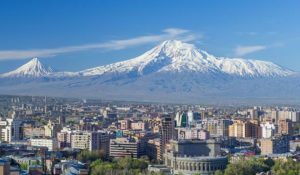 It isn’t certain whether this Ararat is the Biblical Ararat. One of Noah’s descendants is named Ashkenaz (Genesis 10:3). 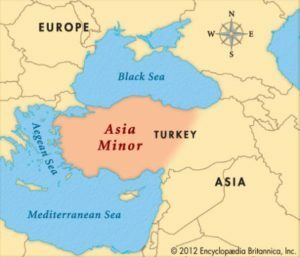 He is a grandson of Yefet, whose children all seem to have inhabited territories in Asia Minor and Armenia. Ashkenaz, too, is in that vicinity. Even in the time of the prophet Jeremiah centuries later, Ashkenaz was a kingdom in Turkey: “Raise a banner in the land, blow the shofar among the nations, prepare the nations against her, call together against her the kingdoms of Ararat, Minni, and Ashkenaz…” (Jeremiah 51:27) The prophet goes on to call on these and other powers in the area to come upon Babylon. Ashkenaz is one of the Turkish kingdoms bordering Babylon to the north, along with Ararat. Amazingly, to this day ethnic Armenians in the region name Ashkenaz as one of their ancestors! This claim is not recent; the fifth-century Armenian scholar Koryun described the Armenians as an Askanazian people. Not surprisingly then, multiple places in Northeastern Turkey today still bear similar-sounding names, including the villages of Iskenaz, Eskenez, and Ashanas. If Ashkenaz is a place in Turkey, how did it become associated with European Jews? Did Ashkenazi Jews come from Turkey? Although Bulan did not impose his new religion on anyone, it is thought that much of his kingdom had become Jewish anyway within about a century. Remarkably, a large reserve of antique Khazar coins was found in Sweden in 1999, bearing the inscription “Moses is the Prophet of God”. 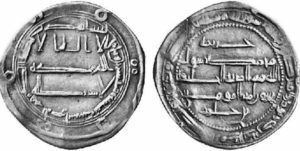 (Modeled on, and sometimes just refashioned from, Arab coins saying that “Muhammad is the Prophet of Allah”!) Archaeologists have found similar Khazar coins all over the Old World, from England to China, showing the tremendous extent of Khazaria’s wealth and influence. Khazar coin from c. 837 CE, with the inscription “Moses is the prophet of God”. 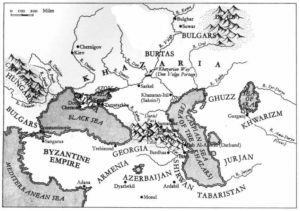 Like all kingdoms, Khazaria had an expiration date. It was eventually overrun by the Rus, Mongols, and others. Some say that many Jewish Khazar refugees migrated westward to Europe, and settled in the sparsely populated and resource-rich lands of Germany. Since they had come from a place traditionally known as Ashkenaz, they were labelled “Ashkenazi Jews”. This is a great story, but one that has far too many holes. From a historical perspective, most scholars reject the Khazar hypothesis simply because there is little evidence that Khazaria experienced a mass conversion to Judaism. It is generally agreed that only a small portion of the Khazar nobility had converted, at best. Khazaria simply attracted many Jews to settle there since it was a rich kingdom with freedom of religion. In that case, any Jewish refugees that might later flee Khazaria to Europe would not be ethnic Khazars anyway. Then came a huge discovery from the Cairo Geniza. 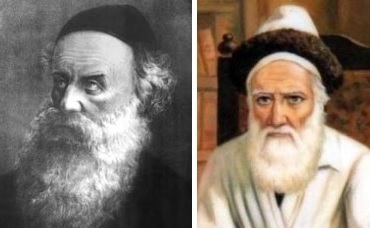 Now known as the Schechter Letter (as it was discovered by Solomon Schechter, 1847-1915), the text is a correspondence between a Khazari Jew and a Sephardi Jew, most likely Hasdai ibn Shaprut (c. 915-970 CE). The letter includes a brief history of Khazaria, and states that Khazaria’s Jews originally came from Persia and Armenia, from which they had fled persecution. One of their descendants, named Sabriel, eventually rose to Khazarian nobility, and finally became king. His wife, Serach, convinced him to go public with their Jewish heritage, and they did, inspiring others in the kingdom to convert to their new king’s religion. The Schechter Letter confirms that the majority of the Jews in Khazaria were not actually Turkic converts but migrants from Persia and Armenia. Shortly after the letter was written, the Khazari Kingdom fell apart in 969 CE. (We know the letter must have been written after 941 CE, since it refers to a battle in that year for which we have other historical records.) The supposed Jewish exodus from Khazaria would have happened in the ensuing decades. Yet, we read in the commentaries of French-born Rashi (Rabbi Shlomo Itzchaki, 1040-1135) how he learned certain things from his visits to Jewish communities in neighbouring Ashkenaz (see, for example, Ketubot 77a), and that Ashkenaz is undoubtedly German (with Rashi occasionally using German/“Ashkenazi” words, as in Sukkah 17a, for instance). This implies that by Rashi’s time—less than a century after the fall of Khazaria—a geographical region in Western Europe referred to as “Ashkenaz” was already well-known, with Jews there freely conversing in German. It is unlikely that this would happen so soon after the fall of Khazaria; Ashkenaz must have existed long before. Besides, we know that Jews already lived in Europe at the time of Charlemagne (742-814 CE), who had a good relationship with his Jewish subjects. Charlemagne was born right around the time King Bulan is supposed to have converted to Judaism, and before the rise of Sabriel (whom some identify with Bulan). This alone proves that Jews were already living in Europe long before any Khazari Jews appeared on the scene. The Rosh speaks of three distinct European Jewish communities: Sefarad, Ashkenaz, and Tzarfat (France). This makes one wonder whether Rashi would have considered himself Ashkenazi (as people typically see him today) or Tzarfati? 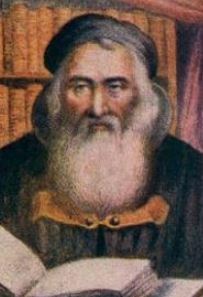 Rashi was born and died in Troyes, France, though he spent time in Worms and Mainz in Germany, hence the reference above to his having learned things while visiting “Ashkenaz”. This implies that Rashi may not have considered himself Ashkenazi at all. (His father was called Rabbi Itzchak haTzarfati, and though he lived for a time in Worms, probably hailed from Lunel in Southern France.) Whatever the case, we see that the Sefardi, Ashkenazi, and Tzarfati Jewish communities were already firmly entrenched at the time of Khazaria’s fall. Science can shed further light on Ashkenazi origins. One study of mitochondrial DNA (mtDNA, which is passed strictly from mother to child) found that some 40% of Ashkenazi Jews come from a group of mothers in Europe, possibly converts, approximately 2000 years ago (another related study here). This would have been around the destruction of the Second Temple. We know that many Jews fled Judea (or were expelled) at the time, and settled across the Roman Empire and beyond. Similarly, a study of Y chromosomes (passed strictly from father to son) shows that most Ashkenazi Levites have a common ancestor who lived at least 1500 years ago, most likely in the Middle East or already having migrated to Europe. These scientists conclude that the Khazar hypothesis is “highly unlikely”. What we see from genetic studies is that most Ashkenazi Jews today descend from ancestors that were already in Europe long before the rise of the Khazars. Historical evidence confirms the existence of widespread Jewish communities in Europe before the time of Khazaria, too. In reality, the Khazar hypothesis keeps being resurrected because it is a convenient tool for anti-Semites to attack modern Jews as “imposters” (meanwhile completely forgetting the other half of the world’s Jews which are not Ashkenazi at all!) or for anti-Zionists to deny a Jewish connection to the land of Israel. Having said all that, we must still answer the key question: where did the “Ashkenazi” label come from? When we look at the seventy “original” nations—descendants of Noah—we find that they represent a very small geographical area. 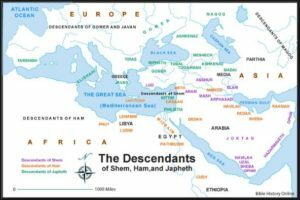 Of the seventy, fourteen come from Yefet and represent Asia Minor, Armenia, and the Aegean islands (Genesis 10:5), nine are Cushites (presumably dark-skinned people), eight of Mitzrayim, twelve are Canaanites, and twenty-six are Middle Eastern, or possibly even just Mesopotamian. As already mentioned, the Torah’s narratives are confined to a narrow geographical space that was relevant to the ancient Israelites. When Jews started migrating out of Israel and beyond the Middle East, they needed to come up with names for these new territories they inhabited. So, they adapted the Biblical place-names of locations that no longer existed or whose identity was no longer known. For example, Sefarad became Spain and Tzarfat became France. When scripture speaks of Sefarad or Tzarfat (as in Ovadiah 1:20), it is certainly not speaking of Spain or France! For instance, the prophet Elijah went to Tzarfat, which is described as being next to Sidon (I Kings 17:9). Sidon is, of course, a well-known ancient city, in what is now Lebanon. For the first Jews who settled in Spain and France, they had migrated the farthest West they could possibly go at the time. For them, these new lands were the most distant from Jerusalem, so they fittingly adapted terms for places described as being exceedingly far from the Holy Land (as in Ovadiah 1:20). They couldn’t use the names of places that were still extant, but only those ancient names that were no longer relevant. In the same fashion they described Germany as “Ashkenaz”, while Bohemia was surprisingly called “Canaan”. Therefore, to say that Ashkenazi Jews are Turkish because Ashkenaz was originally a place in Turkey is like saying French Tzarfati Jews are Lebanese because Tzarfat was originally a place in Lebanon! It is worth pointing out here that scholars have also recently pinpointed the Biblical Sefarad. There is now strong historical evidence to identify Sefarad with the ancient town of Sardis, also in Asia Minor (modern Turkey), of course. Sardis was known to the Lydians who inhabited it as Sfard, and to the Persians as Saparda. 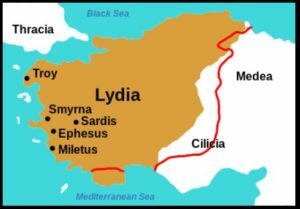 It goes without saying that Sephardic Jewish origins have nothing to do with Turks, as don’t the origins of Lydians (probably the “Ludim” of Genesis 10:13, or the Lud of Genesis 10:22), nor the Yavanim, the Greek Ionians, all of whom inhabited that same area of Asia Minor. After telling us the divisions of the nations in Genesis 10, the Torah goes on to relate the narrative of Migdal Bavel. We are told that the people were all still unified at this point, speaking one tongue. They gathered in Babylon to build a tower to the Heavens, with nefarious intentions. Their plans were thwarted by God, who then scattered the people all over the world and confounded their tongues. From a mystical perspective, at this point those seventy root nations—which originally inhabited Asia Minor and the Middle East—were spread all around the globe into a multitude of various peoples with new cultures and languages. Thus, all of the world’s thousands of nations and ethnicities, wherever they may be, are spiritually rooted in one of Noah’s seventy descendants. The oldest son of Gomer was Ashkenaz. He and his descendants first settled around the Black Sea and then moved north into a land which is called Ascenia, and which later became known as the Islands of Scandia, which we now know as Scandinavia. You can trace a direct link between Ashkenaz and Scandinavia. Basing himself on earlier sources, he lists Ashkenaz as referring to all Saxons, Scandinavians, and Germanic tribes. This argument was made at least as far back as the 4th century (long before the Khazars appeared on the scene), in Eusebius’ Historia Eccliesiastica, where Ashkenaz is Scanzia, another name for Scandinavia and/or Saxony. Around that same time, the Talmud (Yoma 10a) identifies Gomer (the father of Ashkenaz) with Germamia. While this Germamia is possibly referring to Cimmeria, or Germanikia in Syria—which would have been more familiar to the Babylonian Sages living in the Persian Empire—it is very likely that Jews who settled in Germany would see Germamia as referring to their new land. 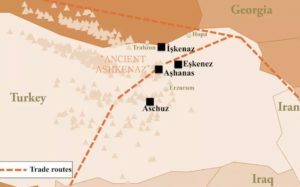 Combined with the alliteration between “Ashkenaz” and “Saxony”/“Scanzia”, we can understand why the Jews that settled in Germany adapted the name Ashkenaz. As an intriguing aside, the Talmud cited above holds that Yefet is a forefather of the Persians, too. The Talmud reads: “How do we know that the Persians are derived from Yefet? Because it is written: ‘The sons of Yefet: Gomer, and Magog…’” The Sages seem to connect Magog with the Persians. That might make alarm bells go off in the heads of modern readers who see Iran as playing a central role in an End of Days Gog u’Magog scenario. To conclude, the hypothesis that Ashkenazi Jews originate among Turkish converts is completely false. While some Turkish converts certainly joined the Jewish nation in the Middle Ages, Ashkenazi Judaism predates this phenomenon by centuries. Both historical evidence and genetic analyses confirm a European Jewish presence as far back as 2000 years ago. Some researchers thought it was possible that these could have been inherited from the Khazars, but this idea is no longer viable. Ashkenazim belong to the Q haplogroups that were later precisely identified as Q-Y2200 (Q1b1a1a1a) and Q-YP1035 (Q1b1a1a1a2a2). On the Y chromosome tree, Q-Y2200’s parent haplogroup Q-Y2225 (Q1b1a1a1) was found in an Italian sample from Sicily, and geneticists determined that QY2225’s distant ancestors had apparently lived in the Middle East. 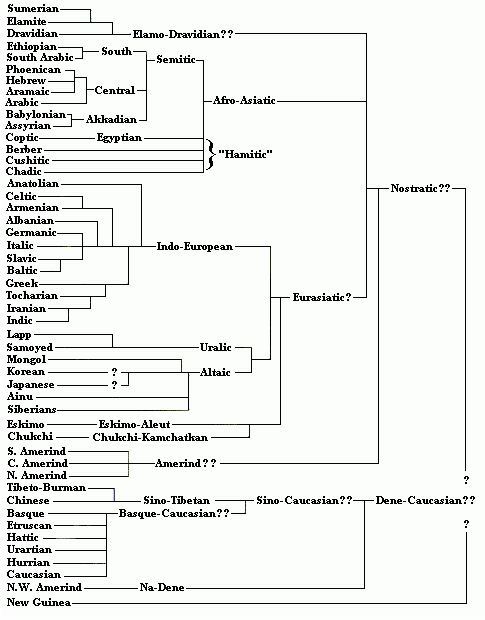 The Ashkenazic branches of Q are very different from Q1a1b-M25 and Q1a2-M346, which are common among Turkic-speaking peoples, and the common ancestor between them all lived many thousands of years ago, far in advance of Khazaria’s existence. This entry was posted in Archaeology & History, Mysteries & Origins, Torah & Science and tagged Ancient Greece, Ararat, Armenia, Ashina, Ashkenazi and Sephardi, Biblical Geneology, Book of Jeremiah, Cairo Geniza, Canaan, Charlemagne, Convert, Elijah/Eliyahu, Eusebius, Genetics, Germany, Gog u'Magog, Ham, Japheth, Khazars, King Bulan, Kuzari, Language, Noach (Parasha), Noah, Number 70, Ovadia (Prophet), Persia, Rashi, Rosh (Rabbi Asher ben Yechiel), Sabriel, Sardis, Saxons, Shem, Solomon Schechter, Table of Nations, Tower of Babel, Turkey, Tzarfat, Yefet, Yoma (Tractate) on October 9, 2018 by Efraim Palvanov. This week’s parasha is named after Korach, the rebellious cousin of Moses. Korach felt he had been unfairly slighted. Moses had apparently made himself like a king over the people, then appointed his brother Aaron as high priest. The final straw was appointing another cousin, the younger Elitzaphan, as chief of the Kohatites, a clan of Levites of which Korach was an elder. Where was Korach’s honour? Korach’s co-conspirators were Datan and Aviram, leaders of the tribe of Reuben. They, too, felt like they’d been dealt a bad hand. After all, Reuben was the eldest son of Jacob, and as the firstborn among the tribes, should have been awarded the priesthood. The Sages explain that Reuben indeed should have held the priesthood. Not only that, but as the firstborn, he should have also been the king. Reuben, however, had failed in preventing the sale of Joseph, and had also committed the unforgivable sin of “mounting his father’s bed”. For this latter crime especially, and for being “unstable like water”, Jacob declared that Reuben would “not excel” or live up to being “my first fruit, excelling in dignity, excelling in power” (Genesis 49:3-4). Levi merited to hold the priesthood because the Levites were the only ones not to participate in the Golden Calf incident (Exodus 32:26). The Book of Jubilees (ch. 32) adds a further reason: Jacob had promised to God that he would tithe everything God gave him (Genesis 28:22), and everything included his children. Jacob thus lined up his sons, and counted them from the youngest up. The tenth son, the tithe, was Levi (who was the third-oldest, or “tenth-youngest”, of the twelve). And so, Levi was designated for the priesthood, to the service of God. Judah merited the royal line for his honesty and repentance—particularly for the sale of Joseph, and for the incident with Tamar. He further established his leadership in taking the reins to safely secure the return of Benjamin. The name Yehudah comes from the root which means “to acknowledge” and “to be thankful”. Judah acknowledged his sins and purified himself of them. Ultimately, all Jews would be Yehudim, the people who are dedicated to repentance and the acknowledgement and recognition of Godliness in the world. Much of a Jew’s life is centered on prayers and blessings, thanking God every moment of the day, with berakhot recited before just about every action. The title Yehudi is therefore highly appropriate to describe this people. Yet, it is not the only title. Long before Yehudi, this people was known as Ivri, “Hebrew”, and then Israel. What is the meaning of these parallel names? Hebrew: Ethnicity or Social Class? The first time we see the term “Hebrew” is in Genesis 14:13, where Abraham (then still called Abram) is called HaIvri. The meaning is unclear. The Sages offer a number of interpretations. The plain meaning of the word seems to mean “who passes” or “who is from the other side”. It may refer to the fact that Abraham migrated from Babel to Charan, and then from Charan to the Holy Land. Or, it may be a metaphorical title, for Abraham “stood apart” from everyone else. While the world was worshipping idols and living immorally, Abraham was “on the other side”, preaching monotheism and righteousness. An alternate approach is genealogical: Ever was the name of a great-grandson of Noah. Noah’s son Shem had a son named Arpachshad, who had a son named Shelach, who had a son named Ever (see Genesis 11). In turn, Ever was an ancestor of Abraham (Ever-Peleg-Reu-Serug-Nachor-Terach-Abraham). Thus, Abraham was called an Ivri because he was from the greater clan of Ever’s descendants. This must have been a powerful group of people recognized across the region, as attested to by Genesis 10:21, which makes sure to point out that Shem was the ancestor of “all the children of Ever”. Amazingly, archaeological evidence supports this very notion. One of the “Habiru” described in Egyptian texts are the “Shasu YHW” (Egyptian hieroglyphs above), literally “nomads of Hashem”. Scholars believe this is the earliest historical reference to the Tetragrammaton, God’s Ineffable Name, YHWH. Defining “Hebrew” as an unwanted, migrating social class also solves a number of other issues. For example, Exodus 21:2 introduces the laws of an eved Ivri, “a Hebrew slave”. When many people read this passage, they are naturally disturbed, for it is unthinkable that God would permit a Jew to purchase another Jew as a slave. Yet, the Torah doesn’t say that this is a Jew at all, but an Ivri which, as we have seen, may refer to other outcasts from an inferior social class. The Habiru are often described as slaves or servants in the historical records of neighbouring peoples, so it appears that the Torah is actually speaking of these non-Jewish “Hebrews” that existed at the time. Regardless, the Torah shows a great deal of compassion for these wanderers, and sets limits for the length of their servitude (six years), while ensuring that they live in humane conditions. Though he was certainly no slave or brigand, Abraham was undoubtedly a “rebel” in the eyes of the majority. To them, he was a “criminal”, too, as we read in the Midrash describing his arrest and trial by Nimrod the Babylonian king. 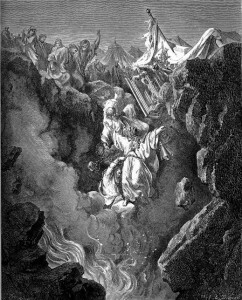 Abraham spent much of his life wandering from one place to another, so the description of “nomad” works. So does “warrior”, for we read of Abraham’s triumphant military victory over an unstoppable confederation of four kings that devastated the entire region (Genesis 14). There is no doubt, then, that Abraham would have been classified as a “Habiru” in his day. His descendants carried on the title. By the turn of the 1st millennium BCE, it seems that all the other Ivrim across the region had mostly disappeared, and only the descendants of Abraham, now known as the Israelites, remained. The term “Hebrew”, therefore, became synonymous with “Israelite” and later with Yehudi, “Judahite” or “Jew”. (This is probably why later commentators simply assumed that the Torah was speaking about Jewish slaves in the Exodus 21 passage discussed above.) To this day, in many cultures and languages the term for a “Jew” is still “Hebrew”. In Russian it is yivrei, in Italian it is ebreo, and in Greek evraios. In other cultures, meanwhile, “Hebrew” is used to denote the language of the Jews. It is Hebrew in English, hebräisch in German, hébreu in French. In fact, another rabbinic theory for the origins of the term Ivri is that it refers specifically to the language. In Jewish tradition, Hebrew is lashon hakodesh, “the Holy Tongue” through which God created the universe when He spoke it into existence. The language contains those mystical powers, and because the wicked people of the Tower of Babel generation abused it, their tongues were confounded in the Great Dispersion. At that point, God divided the peoples into seventy new ethnicities, each with its own language, giving rise to the multitude of languages and dialects we have today. Hebrew did not disappear, though. It was retained by the two most righteous people of the time: Shem and Ever. According to tradition, they had built the first yeshiva, an academy of higher learning. Abraham had visited them there, and Jacob spent some fourteen years studying at their school. The Holy Tongue was preserved, and Jacob (who was renamed Israel) taught it to his children, and onwards it continued until it became the language of the Israelites. Interestingly, we don’t see much of an association between the Hebrew language and the Hebrew people in the Tanakh. Instead, the language of the Jews is called, appropriately, Yehudit, as we read in II Kings 18:26-28, Isaiah 36:11-13, Nechemiah 13:24, and II Chronicles 32:18. The term Yehudit may be referring specifically to the dialect of Hebrew spoken by the southern people of Judah, which was naturally different than the dialect used in the northern Kingdom of Israel. The evidence leads us to believe that “Hebrew” was a wider social class in ancient times, and our ancestors identified themselves (or were identified by others) as “Hebrew”. This was the case until Jacob’s time. He was renamed Israel, and his children began to be referred to as Israelites, bnei Israel, literally the “children of Israel”. The twelve sons gave rise to an entire nation of people called Israel. The Torah tells us that Jacob was named “Israel” because “he struggled with God, and with men, and prevailed” (Genesis 32:29). Jewish history really is little more than a long struggle of Israel with other nations, and with our God. We stray from His ways so He incites the nations against us to remind us who we are. Thankfully, throughout these difficult centuries, we have prevailed. Within each Jew is a deep yearning to connect to Hashem, hinted to in the name Israel (ישראל), a conjunction of Yashar-El (ישר-אל), “straight to God”. This is similar to yet another name for the people of Israel that is used in the Tanakh: Yeshurun. In one place, Moses is described as “king of Yeshurun” (Deuteronomy 33:5), and in another God declares: “Fear not, Jacob my servant; Yeshurun, whom I have chosen.” (Isaiah 44:2) Yeshurun literally means “upright one”. This is what Israel is supposed to be, and why God chose us to begin with. “Israel” and “Yeshurun” have the same three-letter root, and many believe these terms were once interchangeable. The Talmud (Yoma 73b) states that upon the choshen mishpat—the special breastplate of the High Priest that contained a unique stone for each of the Twelve Tribes—was engraved not Shivtei Israel, “tribes of Israel”, but Shivtei Yeshurun, “tribes of Yeshurun”. By the middle of the 1st century BCE, only the kingdom of the tribe of Judah remained. Countless refugees from the other eleven tribes migrated to Judah and intermingled with the people there. Then, Judah itself was destroyed, and everyone was exiled to Babylon. By the time they returned to the Holy Land—now the Persian province of Judah—the people were simply known as Yehudim, “Judahites”, or Jews. Whatever tribal origins they had were soon forgotten. Only the Levites (and Kohanim) held on to their tribal affiliation since it was necessary for priestly service. As already touched on previously, it was no accident that it was particularly the name of Yehuda that survived. After all, the purpose of the Jewish people is to spread knowledge of God, and within the name Yehuda, יהודה, is the Ineffable Name of God itself. This name, like the people that carry it, is meant to be a vehicle for Godliness. Perhaps this is why the term Yehudi, or Jew is today associated most with the religion of the people (Judaism). Hebrew, meanwhile, is associated with the language, or sometimes the culture. Not surprisingly, early Zionists wanted to detach themselves from the title of “Jew”, and only use the term “Hebrew”. Reform Jews, too, wanted to be called “Hebrews”. In fact, the main body of Reform in America was always called the Union of American Hebrew Congregations. It was only renamed the “Union for Reform Judaism” in 2003! All of this begs the question: what is a Jew? What is Judaism? Is it a religion? An ethnicity or culture? A people bound by some common history or language? By the land of Israel, or by the State of Israel? It cannot be a religion, for many Jews want absolutely nothing to do with religion. There are plenty who proudly identify as atheists and as Jews at the same time. 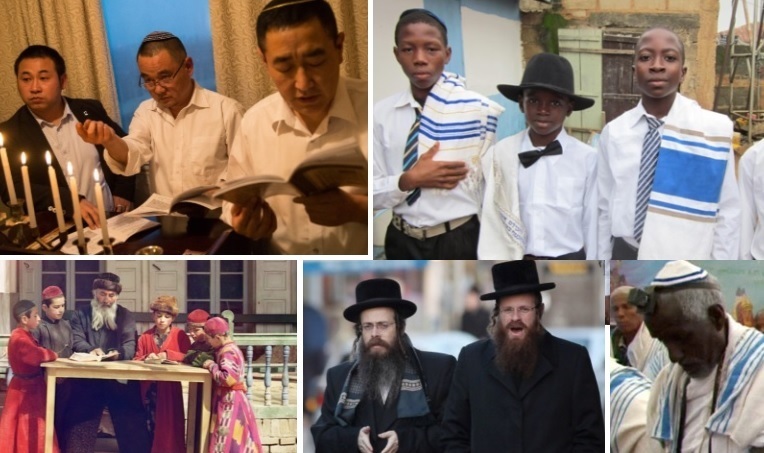 We are certainly not a culture or ethnicity, either, for Ashkenazi Jews, Sephardi Jews, Mizrachi Jews, Ethiopian Jews, all have very different customs, traditions, and skin colours. Over the centuries, these groups have experienced very different histories, too, and have even developed dozens of other non-Hebrew Judaic languages (Yiddish, Ladino, Bukharian, and Krymchak are but a few examples). So, what is a Jew? Rabbi Moshe Zeldman offers one terrific answer. He says that, despite the thousands of years that have passed, we are all still bnei Israel, the children of Israel, and that makes us a family. Every member of a family has his or her own unique identity and appearance, and some members of a family may be more religious than others. Family members can live in distant places, far apart from each other, and go through very different experiences. New members can marry into a family, or be adopted, and every family, of course, has its issues and conflicts. But at the end of the day, a family is strongly bound by much more than just blood, and comes together when it really matters. There is something particularly singular about the Jewish people. We are one house. We are a family. Let’s act like one. This entry was posted in Archaeology & History, Mysteries & Origins and tagged Abraham, Aviram, Babylon, Benjamin, Breastplate, Culture, Datan, Egypt, Elitzaphan, Ephraim, Ever, Family, Genesis, Golden Calf, Great Dispersion, Habiru, Hebrew, Hieroglyphics, Holy Tongue, Israel, Jacob, Jeshurun, Joseph, Kingdom of Israel, Kingdom of Judah, Korach, Korach (Parasha), Language, Lashon HaKodesh, Levi, Levites, Menashe, Mesopotamia, Methuselah, Moses, Nachor, Nimrod, Reform Judaism, Refugees, Repentance, Reuben, Shasu YHW, Shem, Shimon (Simon), Slavery, Sumerians, Tamar (Genesis), Tower of Babel, Twelve Tribes, What is a Jew, Yehuda, Zionism on June 12, 2018 by Efraim Palvanov. ‘Shemot’ is also the name of the second book of the Torah, known in English as ‘Exodus’. This week’s parasha, Shemot, literally means “names”. The Sages stress how important a name really is, so much so that the word shem and neshamah (“soul”) appear to share a root. The Talmud (Berakhot 7b) teaches that a person’s name affects their destiny, and changing one’s name can change one’s fate (Rosh Hashanah 16b). (Other things that can change one’s fate: moving to a new place, charity, prayer, and repentance.) The Zohar (II, 179b) further elaborates that the combinations of letters in a person’s name can reveal much about them. The Midrash also states that Israel merited to be redeemed from Egypt because they preserved their Hebrew names, among other things. * Fittingly, Rav Yitzchak Ginsburgh points out that the midwives Shifrah and Puah ensured the survival of the Jewish babies, so the gematria of their names equals 746, the value of shemot (שמות). What about the others? What was the name of Rachel and Leah’s mother? How about Lot’s salt-pillar-turning wife? The wife of Potiphar that tried so hard to seduce Joseph? It is said that one of the reasons Cain killed Abel is because of a dispute over a girl (see Pirkei d’Rabbi Eliezer, Ch. 21 or Beresheet Rabbah 22:7). What was her name? Luckily, other texts provide the answers. Sefer HaYashar states that the mother of Rachel and Leah was called Adina (עדינה), while the wife of Potiphar was Zuleikha (זליכא). There are two main opinions as to the name of Lot’s wife: either Idit/Edith (עידית), according to sources like Pirkei d’Rabbi Eliezer (ch. 25), or Irit (עירית), according to the commentary of the Ramban (on Genesis 19:17). Another great source for names is the apocryphal Book of Jubilees. Here (4:2) we learn that the name of Cain and Abel’s sister was Aven (און). In traditional Jewish texts, Cain was born with a twin sister and Abel was born with two twin sisters, whom they were meant to marry. Cain reasoned Abel’s second twin should be his wife since he was the elder, and the firstborn deserves a double-portion. Abel argued that if that was the case she would have been born alongside Cain! This was one of their major points of contention, leading to Cain’s murder of Abel. The Book of Jubilees says none of this, and holds that Cain killed Abel out of anger that God did not accept his offering. The Book of Jubilees also states that Noah’s mother was called Bethnah (ביתנה), and his wife was Emtzarah (אמצרה). Meanwhile, the Midrash (Beresheet Rabbah 23:3) holds that Noah’s wife was Na’amah (נעמה), the sister of Tuval-Cain (Genesis 4:22). Interestingly, Jubilees gives us the name of Shem’s wife, too: Tzedeket-Levav (צדקת לבב). This is fitting, since Jewish tradition identifies Shem with Melchizedek. Interestingly, Jubilees states that all three of Noah’s sons built cities for themselves, and named the cities after their wives! The wife of the elder Reuben was a Canaanite woman named Elyarem. Shimon’s wife—according to this particular text; there are other opinions—was his sister Dinah, the daughter of Leah. (The Midrash explains that Shimon had to marry her because he killed Shechem, whom she was meant to marry.) Levi married Adina, a descendent of Ever, one of the forefathers of Abraham. It seems Issachar married Adina’s sister, Arida. Zevulun married a Midianite named Marusha, while Dan married a Moabite woman named Aflala. Naftali married Merimat, a distant cousin descended from Nachor, the brother of Abraham. Gad married her sister Utzit. Asher married a great-granddaughter of Ishmael named Adon, and after she passed away, married a woman named Hadurah. Benjamin had two wives: one called Machlat, and another Arvat, the granddaughter of Abraham from his later wife Keturah. 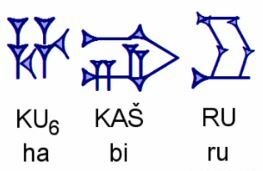 Each of these names certainly carries deep meaning, as do all names and appellations. Jewish texts call God by many different names and titles, each of which captures a different essence of God, and thereby helps us understand Him. Similarly, all of a person’s various names and titles combine to make up who they are. *This is actually a problematic Midrash. Names like Aaron and Pinchas don’t seem to have a meaning in Hebrew but do in ancient Egyptian! Aaron is believed to come from the Egyptian aha rw, “warrior lion”, while Pinchas sounds like the common Egyptian name Pa-Nehasi, “the bronze one”. Thankfully, a variant Midrash preserves a different tradition. While Vayikra Rabbah (Ch. 32) states that Israel was redeemed on account of their names, language, abstaining from lashon hara and licentiousness, Pesikta Zutrata (on Ki Tavo, 46a) states that it was because of their clothing, food, and language. This entry was posted in Midrash, Mysteries & Origins and tagged Aaron, Abel, Alter Rebbe, Amalthea, Amatlai, Angels, Arizal, Bava Batra, Berakhot (Tractate), Book of Jubilees, Cain, Chabad, Clothing, Destiny, Dinah, Fate, Gematria, Kelipot, Language, Lot's Wife, Melchizedek, Midrash, Midrash Rabbah, Na'amah (Noah's Wife), Names, Neshamah, Nitzevet, Noah, Pesikta Zutrata, Pinchas, Pirkei d'Rabbi Eliezer, Puah, Rosh Hashanah (Tractate), Samson (Shimshon), Seder HaDorot, Sefer HaYashar, Shem, Shemot (Parasha), Shifrah, Soul, Twelve Tribes, Tzemach Tzedek, Zohar, Zuleikha on January 1, 2018 by Efraim Palvanov. And these are the genealogies [toldot] of Isaac, the son of Abraham; Abraham begot Isaac. And Isaac was forty years old when he took Rebecca… for a wife. And Isaac prayed to Hashem opposite his wife, because she was barren, and Hashem accepted his prayer, and Rebecca his wife conceived. The Torah explicitly juxtaposes Isaac’s marriage to Rebecca with Isaac’s successful prayer. One of the Torah’s central principles of interpretation is that when two ideas or passages are placed side by side, there must be an intrinsic connection between them. What is the connection between marriage and prayer? Another central principle of interpretation is that when a word or concept appears for the first time in the Torah, its context teaches the very epitome of that word or concept. The first time that the word “love” is used between a man and woman in the Torah is with regards to Isaac and Rebecca, and the two thus represent the perfect marital bond (a topic we’ve explored in the past; see: ‘Isaac and Rebecca: the Secret to Perfect Marriage’ in Garments of Light). So, we see that Isaac and Rebecca were very successful in their love and marriage, and simultaneously very successful in their prayers. In fact, our Sages teach that when the Torah says “Isaac prayed… opposite his wife”, it means that the two prayed together in unison, and some even say they prayed while in a loving embrace, face-to-face, literally “opposite” one another. God immediately answered their prayers. What is the secret of Isaac and Rebecca’s success in love and prayer? It is commonly (and wrongly) believed that prayer is about asking God for things. Not surprisingly, many people give up on prayer when they feel (wrongly) that God is not answering them, and not fulfilling their heartfelt requests. In reality, prayer is something quite different. A look through the text of Jewish prayers reveals that there is very little requesting at all. The vast majority of the text is made up of verses of praise, gratitude, and acknowledgement. We incessantly thank God for all that He does for us, and describe over and over again His greatness and kindness. It is only after a long time spent in gratitude and praise that we have the Amidah, when we silently request 19 things from God (and can add some extra personal wishes, too). Following this, we go back to praise and gratitude to conclude the prayers. Many (rightly) ask: what is the point of this repetitive complimenting of God? Does He really need our flattery? The answer is, of course, no, an infinite God does not need any of it. So why do we do it? One answer is that it is meant to build within us an appreciation of God; to remind us of all the good that He does for us daily, and to shift our mode of thinking into one of being positive and selfless. Through this, we build a stronger bond with God, and remain appreciative of that relationship. The exact same is true in marriage. Many go into marriage with the mindset of what they can get out of it. They are in a state of always looking to receive from their spouse. Often, even though they do receive a great deal from their partner, they become accustomed to it, and forget all the good that comes out of being married. They stop appreciating each other so, naturally, the marriage stagnates and the couple drifts apart. By switching the dialogue to one of positive words and gratitude, we remain both appreciative of the relationship, and aware of how much good we do receive from our other halves. Moreover, such positive words naturally motivate the spouse to want to do more for us, while constant criticism brings about the very opposite result. I have surely heard Ephraim wailing… Ephraim is my precious child; a child of delight, for as soon as I speak of him, I surely remember him still, and My heart yearns for him. I will surely have compassion for Him—thus said Hashem. Ephraim is one of the Biblical names for the children of Israel, especially referring to the wayward Israelite tribes of northern Israel. Despite the waywardness, Ephraim’s cries to God spark God’s compassion and love for His people. The Hebrew word for prayer l’hitpalel, literally means “to judge one’s self”. Prayer has a much deeper purpose: it is a time to meditate on one’s inner qualities, both positive and negative, and to do what’s sometimes called a cheshbon nefesh, an “accounting of the soul”. Prayer is meant to be an experience of self-discovery. A person should not just ask things of God, but question why they are asking this of God. Do you really need even more money? What would you do with it? Might it actually have negative consequences rather than positive ones? Would you spend it on another nice car, or donate it to a good cause? Why do you need good health? To have the strength for ever more sins, or so that you can fulfill more mitzvot? Do you want children for your own selfish reasons or, like Hannah, to raise tzadikim that will rectify the world and infuse it with more light and holiness? Prayer is not simply for stating our requests, but analyzing and understanding them. Through proper prayer, we might come to the conclusion that our requests need to be modified, or sometimes annulled entirely. And when finally making a request, it is important to explain clearly why you need that particular thing, and what good will come out of it. Central to this entire process is personal growth and self-development. In that meditative state, a person should be able to dig deep into their psyche, find their deepest flaws, and resolve to repair them. In the merit of this, God may grant the person’s request. To paraphrase our Sages (Avot 2:4), when we align our will with God’s will, then our wishes become one with His wishes, and our prayers are immediately fulfilled. Once more, the same is true in marriage. Each partner must constantly judge their performance, and measure how good of a spouse they have been. What am I doing right and what am I doing wrong? Where can I improve? How can I make my spouse’s life easier today? Where can I be more supportive? What exactly do I need from my spouse and why? In the same way that we are meant to align our will with God’s will, we must also align our will with that of our spouse. The Torah commands that a husband and wife must “cleave unto each other and become one flesh” (Genesis 2:24). The two halves of this one soul must reunite completely. This is what Isaac and Rebecca did, so much so that they even prayed as one. 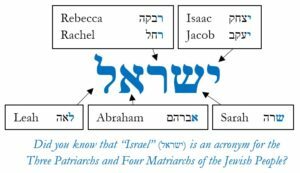 In fact, Isaac and Rebecca were the first to perfectly fulfil God’s command of becoming one, and this is hinted to in the fact that the gematria of “Isaac” (יצחק) and “Rebecca” (רבקה) is 515, equal to “one flesh” (בשר אחד). More amazing still, 515 is also the value of “prayer” (תפלה). The Torah itself makes it clear that marital union and prayer are intertwined. One of the most popular Jewish prayers is “Nishmat Kol Chai”, recited each Shabbat right before the Shema and Amidah. The prayer ends with an acrostic that has the names of Isaac and Rebecca. The names are highlighted to remind us of proper prayer, and that first loving couple which personified it. The last major aspect of Jewish prayer is confession. Following the verses of praise and the requests comes vidui, confessing one’s sins and genuinely regretting them. It is important to be honest with ourselves and admit when we are wrong. Among other things, this further instills within us a sense of humility. The Talmud (Sotah 5a) states with regards to a person who has an ego that God declares: “I and he cannot both dwell in the world.” God’s presence cannot be found around a proud person. In marriage, too, ego has no place. It is of utmost significance to be honest and admit when we make mistakes. It is sometimes said that the three hardest words to utter are “I love you” and “I am sorry”. No matter how hard it might be, these words need to be a regular part of a healthy marriage’s vocabulary. And more than just saying sorry, confession means being totally open in the relationship. There should not be secrets or surprises. As we say in our prayers, God examines the inner recesses of our hearts, and a couple must likewise know each other’s deepest crevices, for this is what it means to be one. In place of surreptitiousness and cryptic language, there must be a clear channel of communication that is always wide open and free of obstructions. To summarize, successful prayer requires first and foremost a great deal of positive, praising, grateful language, as does any marriage. Prayer also requires, like marriage, a tremendous amount of self-analysis, self-discovery, and growth. And finally, both prayer and marriage require unfailing honesty, open communication, and forgiveness. In prayer, we make God the centre of our universe. In marriage we make our spouse the centre of our universe. In both, the result is that we ultimately become the centre of their universe, and thus we become, truly, one. This entry was posted in Jewish Law & Life Cycle, Personal Development and tagged 13 Principles of Exegesis, Book of Jeremiah, Cheshbon Nefesh, Confession, Ephraim, Forgiveness, Gematria, God's Will, Gratitude, Hannah, Humility, Intimacy, Isaac, Judgement, Language, Love, Marriage, Nishmat Kol Chai, Personal Growth, Pirkei Avot, Positive Psychology, Prayer, Rabbi Chiya, Rabbi Isaac, Rav Yehudah, Rebecca, Self-Development, Sotah (Tractate), Soulmates, Spirituality, Toldot (Parasha), Tzadik, Vidui, Wedding, Yevamot (Tractate) on November 13, 2017 by Efraim Palvanov. This week we commence the third book of the Torah, Vayikra (known in English as “Leviticus”). The Zohar begins its commentary on this section by reminding us that the ancient generations—even the lowest and most wicked among them—knew the secrets of the Hebrew alphabet and their permutations. Unfortunately, they sometimes used this knowledge to control angelic forces towards evil ends. Mystical texts describe how angels are formed from God’s speech, and the different combinations of letters of their names give them their powers. The Arizal explains that this is the meaning of Psalms 33:6, “By the word of Hashem the Heavens were made, and by the breath of His mouth all their legions.” He further explains that this is the meaning behind the perplexing words in Exodus 20:14, where the Israelites apparently “saw” God’s voice at Mt. Sinai (וכל העם ראים את הקולת). The Arizal tells us what they saw were the angels emanating from God’s voice. Elsewhere, the Arizal writes that starting in the generation of Enosh (the grandson of Adam), people began manipulating the divine names of angels to suit their own selfish, unholy desires. This is the meaning of Genesis 4:26, “And to Seth was also born a son, and he named him Enosh. It was then that God’s Name began to be profaned.” Rashi famously comments here that in Enosh’s generation idolatry emerged. The Arizal explains that it began with the manipulation of God’s ministering angels through their names. 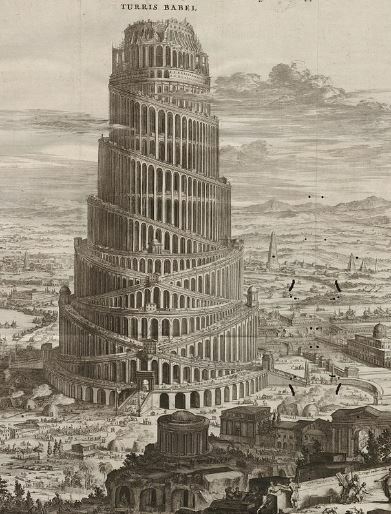 In fact, this is how the Tower of Babel was built. Moreover, the aim of its power-hungry builders was to move beyond angels and learn how to manipulate God Himself! The Torah introduces the passage by saying the Tower generation were “one people with one language” (Genesis 11:1). The Ba’al HaTurim points out that the term “one language” (שפה אחת) has the same gematria as “holy tongue” (לשון הקדש), since the people were experts in the mystical wisdom of Hebrew, the language with which God created the universe, and through which God’s angels emanate. 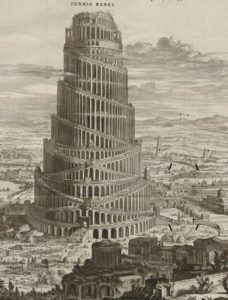 Not surprisingly, the punishment of the Tower builders was to have their language confounded. Their knowledge of Hebrew was taken away, replaced with countless new tongues and dialects. The Zohar’s commentary on this week’s parasha continues by explaining the meaning of the word Vayikra. This word symbolizes God’s primary legion of angels, the one that descended upon the Tent of Meeting together with the Clouds of Glory that rested upon it (Exodus 40:35). 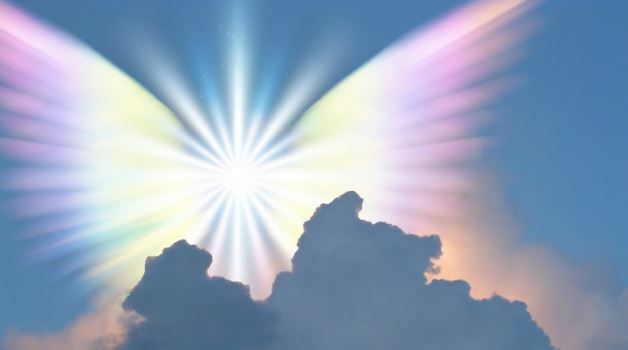 The Zohar says the Cloud was actually meant to conceal these angels. The commanding “general” of this legion is the angel Michael (מיכאל). Below him, his chief officer is called Tzadkiel (צדקיאל). Tzadkiel stands over three “colonels”, each with a “lieutenant” angel, surrounding by twelve ministering angels (three on each of the four sides). The names of the three pairs are Kdumiel (קדומיאל) and Ariel (אריאל), Yofiel (יופיאל) and Chakhamiel (חכמיאל), and Raziel (רזיאל) and Rumiel (רומיאל). The source of their angelic glow is the letter Vav, which emanates from the inner Holy of Holies. Guarding the Holy is Kdumiel’s division, shining with the letter Yud. Before him is Yofiel’s division, shining with the letter Kuf; then Raziel’s with the letter Reish, and finally Tzadkiel with the letter Aleph. This order of letters spells Vayikra (ויקרא). The Zohar goes on to explain the divisions of the second camp of angels that parallel this first camp. While the first is under the command of Michael, the second is under the command of his counterpart Gabriel (גבריאל). His subordinates are Chizkiel (חזקיאל), and under him are Gazriel (גזריאל) with his twelve angels, then Rahatiel (רהטיאל) and Kadshiel (קדשיאל) with their twelve, Kaftziel (קפציאל) and Aza’el* (עזאל) with their twelve, as well as the twelve around Shmiel (שמעיאל) and Ragshiel (רגשיאל), who move between the camps of Michael and Gabriel. Altogether, these camps are symbolized by the letters of vayikra. The parasha begins with the words Vayikra el Moshe, “And He called unto Moses”. The Zohar suggests that when God called out to him, Moses saw a vision of all these angels in their divisions. Moses was entrusted with the wisdom of their names and powers—information that had been kept secret since the Great Dispersion and confounding of languages that followed the Tower episode. The root of vayikra means to “call out” or to “name”, as the angels are brought into existence through God “calling” them forth and naming them with their task. It is not a coincidence that the term vayikra appears in Genesis 4:26, cited above, where we are told the names of angels began to be manipulated. In total, the term vayikra appears 90 times in the Torah. Meanwhile, the gematria of the word “angel” (מלאך) is 91. The Kabbalists teach that when the value of a word is one more than another, this progression of numbers suggests that the former emanates from the latter. Indeed, we see how angels (91) emanate from God’s call, vayikra (90). Of course, God is the Commander-in-Chief of all His legions (“Hashem Tzevaot”). He is most commonly referred to as the King, and this is how the angels address Him. The value of “king” (מלך) is also 90. This should remind us that while we read of angelic generals, colonels, and lieutenants, we must never forget Who is really in charge. *Multiple Jewish texts identify Aza’el with a fallen angel (see our previous post here). The Talmud, among other sources, says that Aza’el never repented and remained chained in this physical world, hence the ritual of sending a goat to “Azazel”. If that is the case, how could he be one of the important angels listed above? A careful reading of the Zohar shows that the angel Gazriel stands alone without a partner. All the other angels are paired. (Michael-Tzadkiel, Kdumiel-Ariel, Yofiel-Chakhamiel, Raziel-Rumiel, Gabriel-Chizkiel, Rahatiel-Kadshiel, Shmiel-Ragshiel.) Kaftziel is paired with Aza’el. Perhaps Aza’el was initially placed within this legion, but after his fall, Gazriel took his place. This entry was posted in Kabbalah & Mysticism and tagged Alphabet, Angels, Arizal, Aza'el, Azazel, Ba'al HaTurim, Clouds of Glory, Enosh, Fallen Angels, Gabriel, Gematria, God's Legions, Hebrew, Holy of Holies, Holy Tongue, Language, Lord of Hosts, Michael, Moses, Raziel, Seth, Tabernacle, Tent of Meeting, Tower of Babel, Vayikra, Zohar on March 29, 2017 by Efraim Palvanov.